Call detail records are things like which numbers were called and when, the duration of the call and so on — metadata, no content. But metadata can be just as revealing as content, since it can, for example, place a person near the scene of a crime, or establish that two people were connected even if the conversation they had was benign. What do these increases mean? It’s hard to say. A spokesperson for the ODNI told Reuters that the government “has not altered the manner in which it uses its authority to obtain call detail records,” and that they “expect this number to fluctuate from year to year.” So according to them, it’s just a matter of quantity. 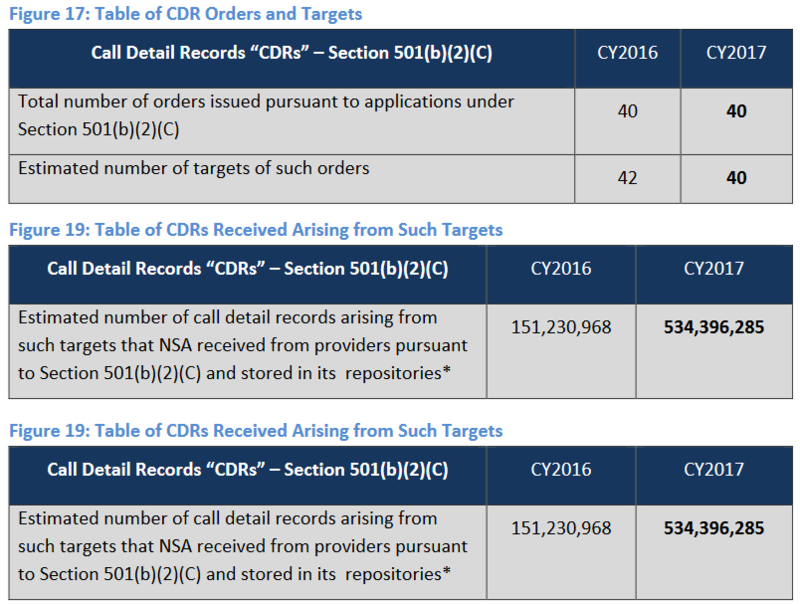 Because one target can yield hundreds or thousands of incidental sub-targets — people connected to the target whose call records will be requested and stored — it’s possible that 2017’s targets just had fatter, longer contact lists and deeper networks than 2016’s. Needless to say this explanation is unsatisfying. Although the NSA’s surveillance apparatus was dealt a check with the 2013 Snowden leaks and subsequent half-hearted crackdowns by lawmakers, it clearly is getting back into its stride.